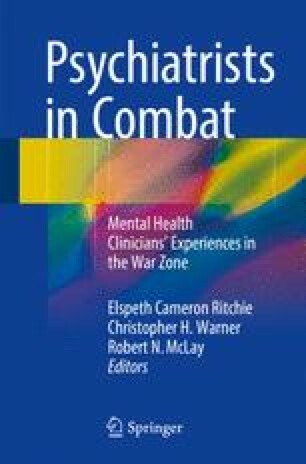 During his first deployment to Iraq, an Army psychiatrist finds himself in the unusual situation of putting himself in the line of fire to treat patients. Along with his teammates in the 785th Combat Stress Company, he disregards the limits of traditional doctrine and takes combat stress care to new, necessary levels by putting himself in the shoes of the combat arms soldier, redefining Army policy and garnering attention from 60 Minutes. In the midst of his accomplishments, however, his marriage begins falling apart, and he returns from deployment to a broken home and heavy feelings of uncertainty about himself and his place in the world. His Army training and deployment experience serve as unlikely sources of strength to guide him through the darkest time in his life. His wife tells his story from her perspective 10 years afterwards. Disclaimer: The views expressed in this chapter are those of the author and do not reflect the official policy of the Departments of Army/Navy/Air Force, Department of Defense or U.S. Government. The author declares no financial, commercial, or other conflict of interests.